The Forex market has a highly decentralised structure meaning that unlike stock exchanges, there is no physical location for the recording of order flow. Consequently, information on these flows is restricted to bank and larger institutional players. To put this in a simpler context: Bank and institutions are able to track portions of order flow in the market but the individual retail trader cannot. To understand the importance of this imbalance we can refer to a report produced by the Bank of International Settlements which sought to establish the value of studying client flows in FX. The report, which was published in 2013 but revised in 2016, looked at a number of different aspects including what it is that characterises different FX customer groups (e.g., are they contrarian investors, do they take on risk or hedge against it, do they speculate on trends?) and whether large dealers possess an advantage from their ability to view a large percentage of customer trades? Hedge Funds are associated with temporary currency movement suggesting shorter term positioning and the liquidity effects of large trades. To quantify the value of these different client flow, the study used a simple portfolio approach which found that currencies with highest net buying pressure outperformed currencies with the highest net selling pressure by 10% pa. The conclusion here is that the flow of Institutional players e.g., Banks and Hedge Funds represents a significantly superior alignment with future pricing than that of Corporate and private flows. So how can the retail trader take advantage of this information? Fortunately, The CFTC compiles weekly Commitment of Traders data reports on the positioning of participants in the currency futures markets, data which translates directly into the spot FX markets. The data tracks the positioning of Non Commercial players (banks and institutions) as well as Commercial players (Corporates) and Private clients. The weekly report released each Thursday/Friday references the positioning of these players over the weekly period from the Tuesday of the previous week to Tuesday of that week. The report is long and complicated for new traders, though fortunately many websites now present the data taken from those reports in neat visual graphics updated each week. Essentially, given what we know about the power of institutional order flow as discussed in the BIS report it makes sense that we would look to trade in the same direction as these major institutions and essentially piggyback their order flow. The chart above shows the Non-Commercial positioning in GBPUSD going back to 2012 with the Yellow line representing price and the shaded blue region tracking positioning. When the blue shaded region (positioning) crosses above the center line, it represents a net-long position, and when it crosses below the center line it represents a net-short position. The red circles highlight periods when positioning flipped from long to short and the green circles highlight period where the positioning flipped from short to long. As shown by the circles, when major institutions shift their bias (e.g., long to short, short to long) these tend to be key times for the market and can often be followed by the development of a significant trend. The power of following a trend as denoted by positioning can be a fantastic asset to traders but of course, no trends last forever and so it is wise to be alert, though not neurotic, to potential reversal signals. One of the most reliable signals is when positioning moves into extreme levels which usually signals capitulation and exhaustion in the trend and highlights the likelihood of reversal. 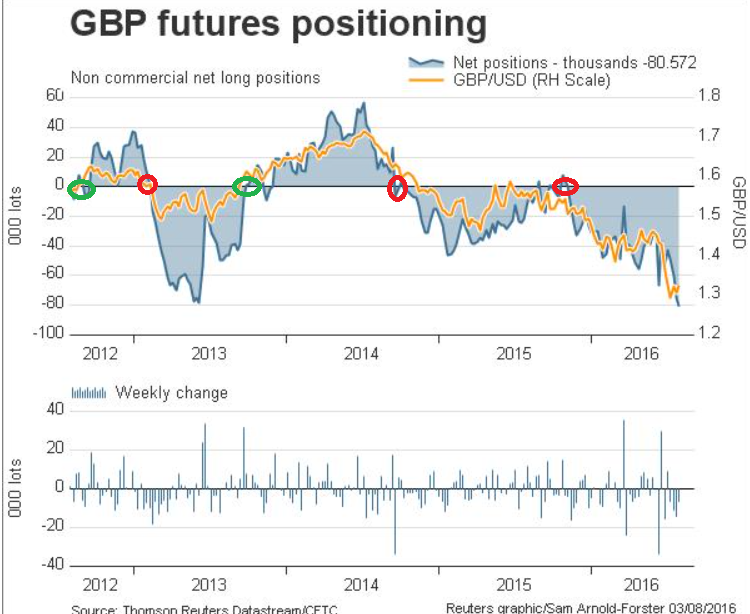 This chart shows the COT positioning in GBPUSD back to 2008, again the shaded blue bars on the price chart are positioning and the yellow line is price. Look how price reacted each time positioning moved to -50, price tended to rally shortly after, and look what happened each time positioning moved to +50, price tended to sell off shortly after. Similar to what we discussed in point three, identifying divergent positioning can be another tell-tale sign of a potential reversal in the offing as institutions are displaying less interest in pursuing the move. In this example, we can see that USDJPY is moving higher and higher but the actual build in JPY shorts is getting less and less indicating dwindling momentum before finally positioning shifts. Whilst the data can indeed be a fantastic tool for helping traders establish directional bias in the market as well as identify period of potential reversal there are a few issues that we need to consider. First of all the data is backdated meaning it tells us how institutions were positioned the prior week and not right now nor how they will be positioned in future. However, if we are looking to trade with the trend and assume that institutions are following a directional path then it still provides a great guideline. 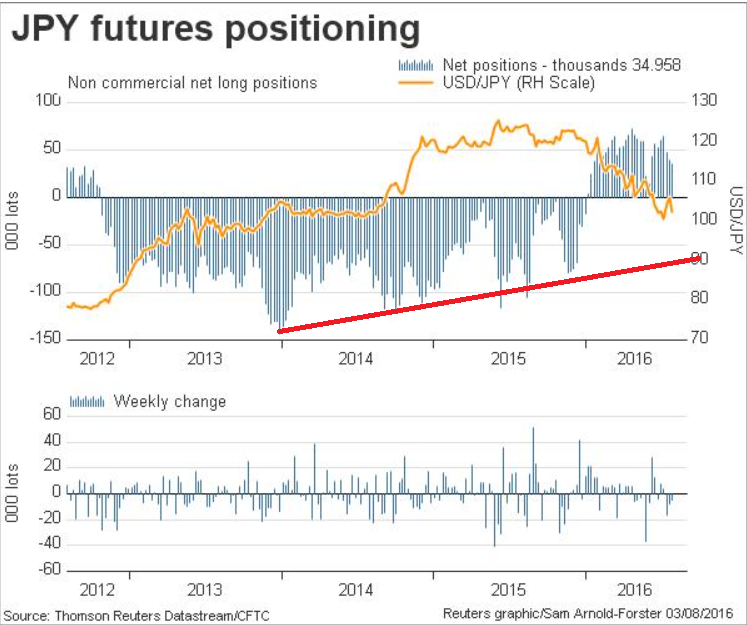 However, as mentioned earlier, rather than using the data week on week look out for key developments such as a shift in positioning and extreme or divergent positioning. Next articleHow to Trade the Wedge Pattern Objectively?